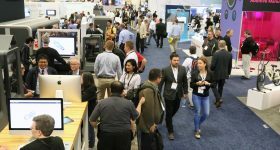 3D Printing Industry has returned to Chicago for the 2018 edition of IMTS. Held in every even-numbered year, IMTS is North America’s leading manufacturing technology show. The 2,123 booths cover 1,424,232 sq. ft., and final visitor numbers are expected to exceed 120,000 by the end of the week. One attendee with a background in the computer industry told me that IMTS reminded him of COMDEX at its peak. But visitor numbers are not the only impressive stat. Over 25 million kilos of industrial equipment are loaded into (and out of) McCormick Place. 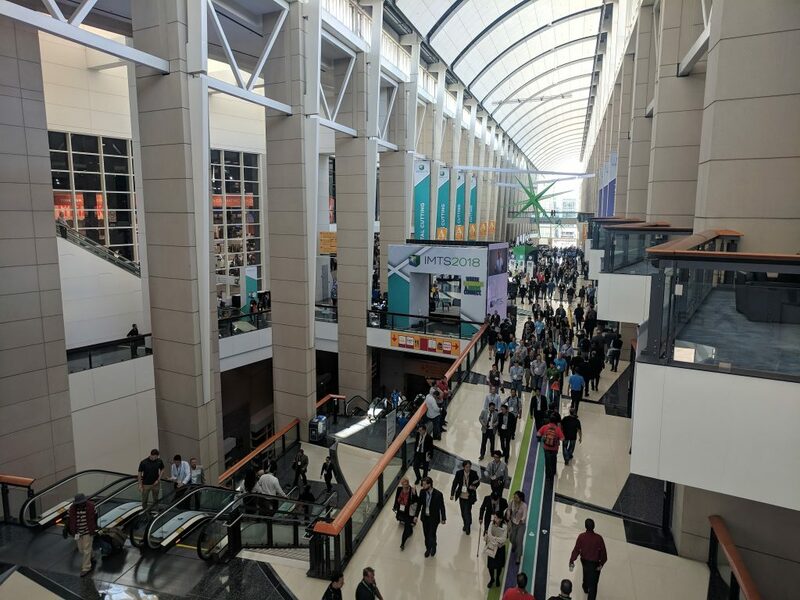 The venue is also the largest convention center in North America, and IMTS 2018 is the first event to occupy all four buildings. When 3D Printing Industry attended IMTS in 2016, approximately 20 additive manufacturing enterprises were exhibiting. By both numbers and floor space occupied this number has grown for 2018. 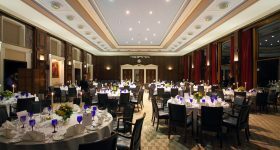 Although listing only 51 companies in the event directory, the amount of floor space occupied has grown significantly. As has the number of people talking about additive around the show. America Makes is hosting a daily Knowledge Bar in the center of the Additive Manufacturing pavillion in the West Building and some 50 companies will give presentations and be available for discussion with visitors over the five days of IMTS. While hype may be creeping back (did it ever leave?) into the industry, many companies are quietly getting on with making additive manufacturing production a reality. One executive tells me about the 13 million 3D printed products made for an well known brand, and the 320,000 Invisalign Aligners made daily using 3D Systems equipment are further evidence of AM as a production technology. Understandably, the companies gaining an edge with additive are not shouting about this from the rooftops. 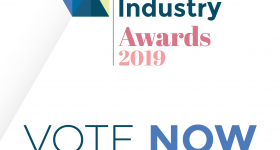 Although in 2018, it should come as no surprise to a competitor that 3D printing is the not-so secret weapon for enterprises leading their sectors. 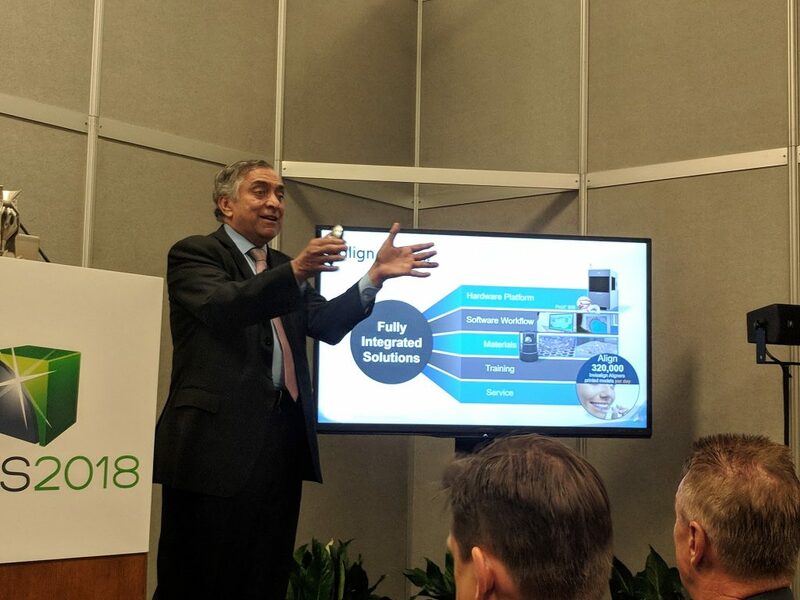 3D Systems CEO VJ at IMTS 2018. Photo by Michael Petch. 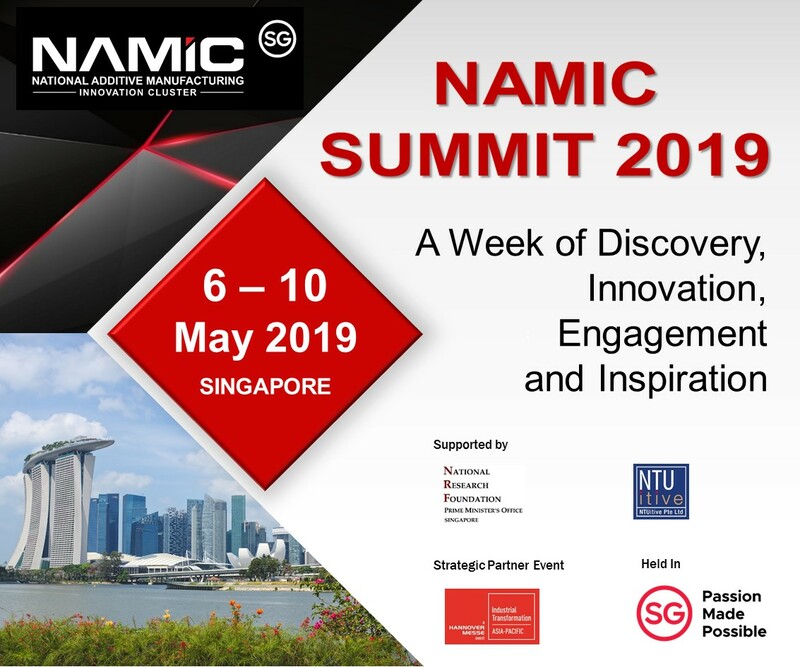 On Monday, DMG Mori President Dr. Masahiko Mori stated his belief that the 2020s will be the decade of Additive Manufacturing. 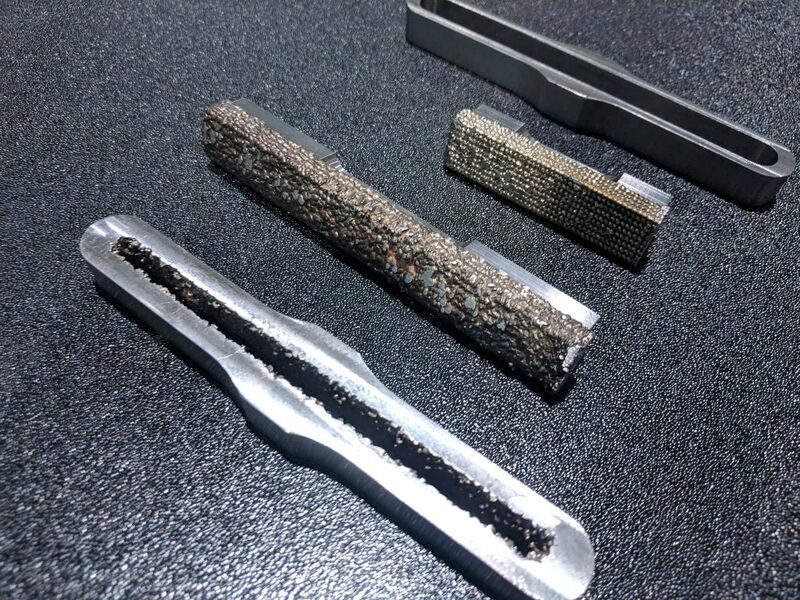 By 2025 Dr. Mori expects that if a machine shop has 10 machine tools operating with spindles, they should also have at least 1 or 2 industrial additive systems – leading to 20% of production made using AM by 2030. With this in mind DMG Mori is, “spending thousands of millions of Euros on this [AM] type of technology,” he says. 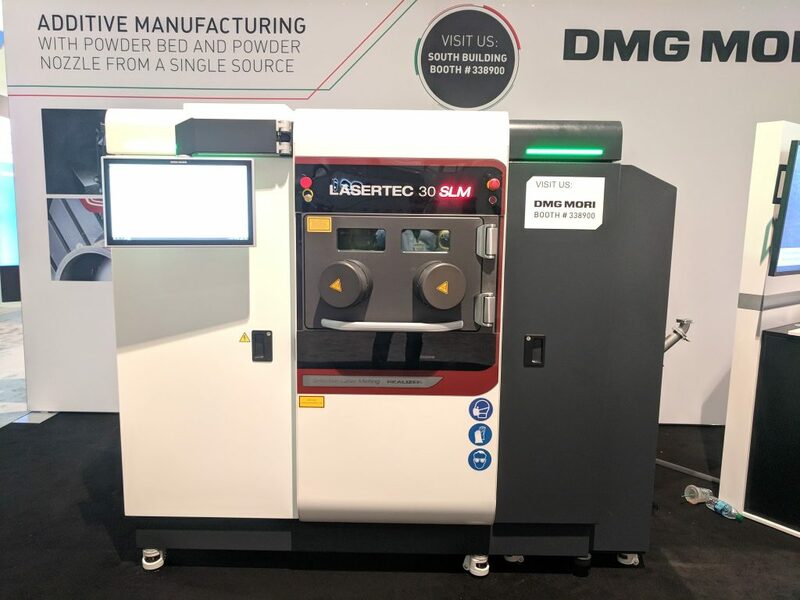 The DMG Mori LaserTec 30 SLM at IMTS 2018. Photo by Michael Petch. This year Additive Manufacturing and industrial 3D printing hardware can mainly be found in the West Building of McCormick Place. Located approximately 1 mile away in the East building are a number of enterprises handling the software side. At the center of the Additive Manufacturing pavillion is the aforementioned America Makes Knowledge Bar. Also based here is the Die-in-a-Day Scavenger Hunt. This event is led by the Department of Energy’s Oak Ridge National Laboratory (ORNL) and designed to illustrate how AM can be used to go from, “design and prototype production to final inspection, in one day.” Each day dies including a motorcycle cover, a valve cover, a plate, a business card holder and a bike stem will be made in conjunction with other exhibitors. On leaving the Emerging Technology Center, visitors can see BeAM, FATHOM and XOMETRY. The UK’s Renishaw has brought the RENAM 500M to IMTS and the first large booth is occupied by Stratasys. 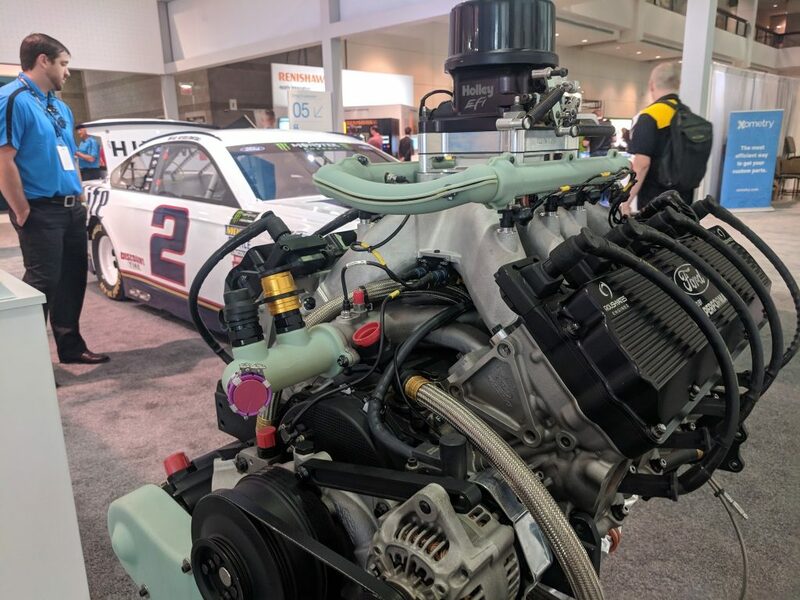 Stratasys has been granted the rare permission to bring a Team Penske race car to IMTS and is using it to illustrate how 3D printing is helping the team to win. In particular the capabilities of the Stratasys 380CF are on display. The 380CF is an FDM 3D printer dedicated to printing chopped carbon fiber. 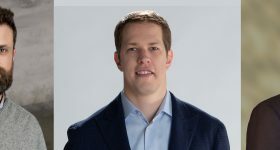 Patrick Carey, SVP Sales, and developer of the new 3D printer explains the printer came about in response to requests from clients. 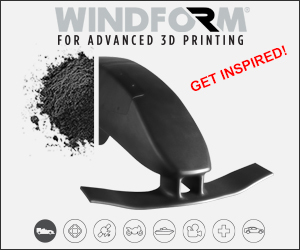 With a significantly lower price point than Stratasys equipment of a comparable level, the 380CF has hardened elements for running carbon fiber, specialist nozzles and customized software – development took only 5 months. 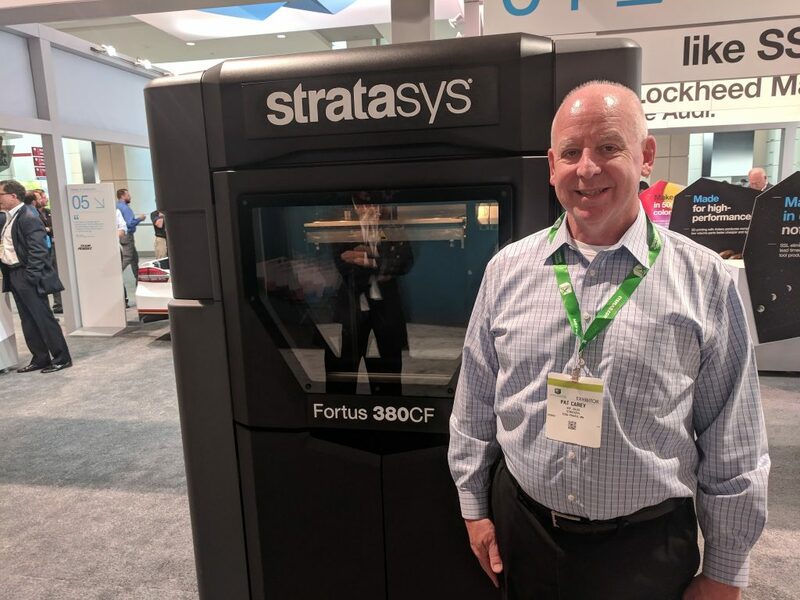 Pat Carey and his Stratasys Fortus 380CF. Photo by Michael Petch. Metal 3D printing at Stratasys is also on display at IMTS. Initially rumors were that the system would be a binder jetting based machine, however speculation around IMTS is that this is not the case. Interestingly the Stratasys metal 3D printer now has a name. The metal 3D prints are labelled as made using Stratasys LPM 3D Printing. These components demonstrate a range of complex geometries not possible with traditional CNC, and in some cases neither with DMLS. 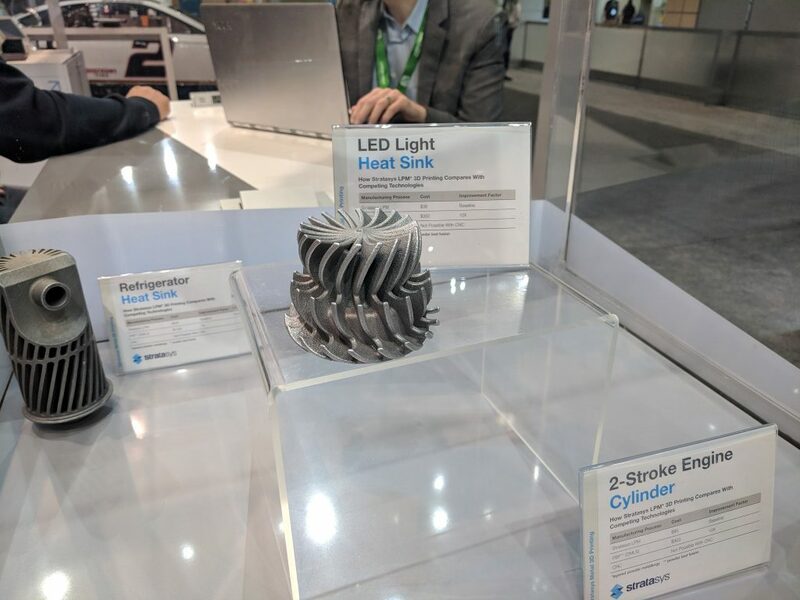 By cost, the various 3D printed metal heat sinks, engines cylinders, oil pump housings range from 5 to 10 ten times cheaper than manufacturing via powder bed fusion metal 3D printing. 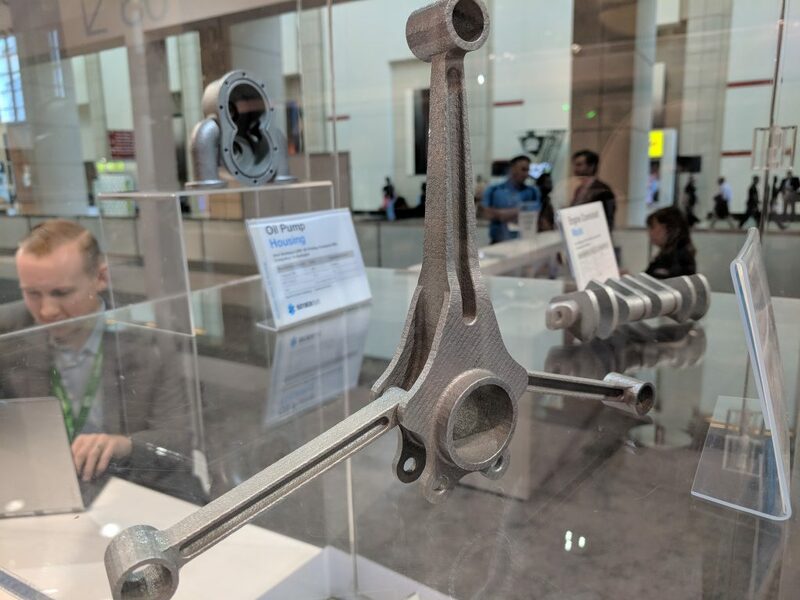 Stratasys metal AM at IMTS 2018. Photo by Michael Petch. 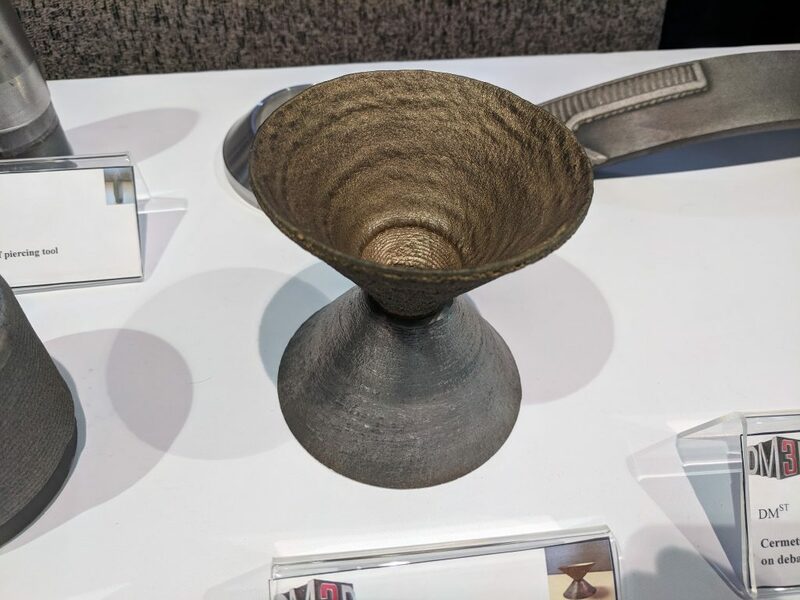 Stratasys metal 3D printing at IMTS 2018. Photo by Michael Petch. HP is also exhibiting two new 3D printers. The Metal Jet is a binder jet system that uses a secondary sintering stage to produce metal components. Many of these are on display around the booth illustrating applications in automotive and the medical sector. 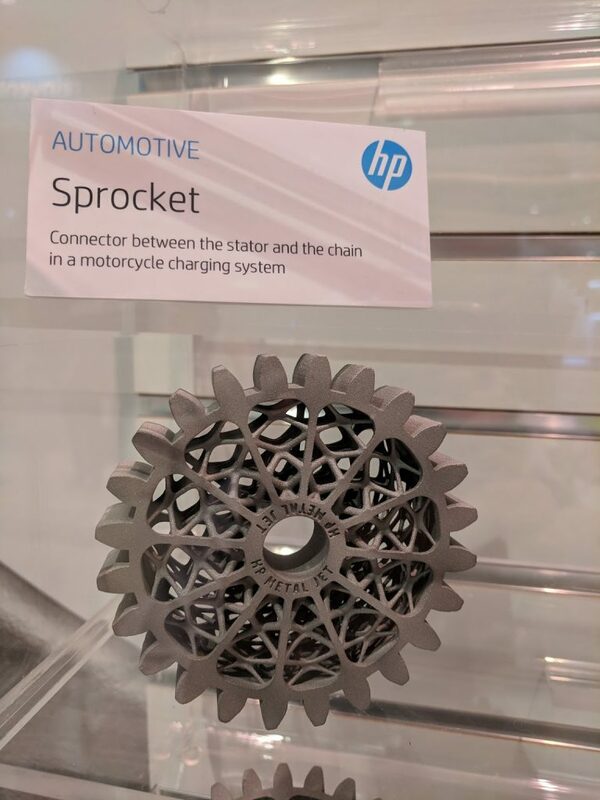 Initially revealed in October 2017, this is the first public outing for HP’s first venture into metal 3D printing. 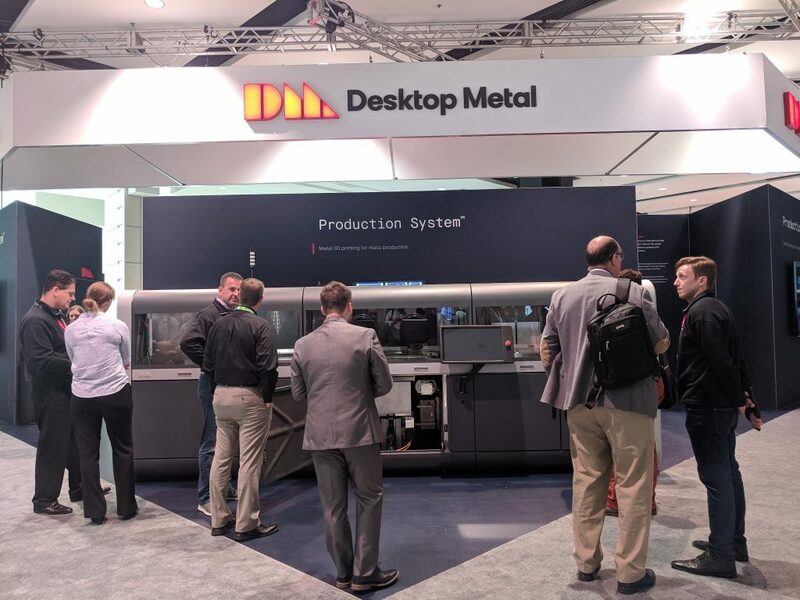 Using a binder jet process and MIM powder as a material the Metal Jet will be entering into competition with Desktop Metal’s forthcoming Production System – on display in a new larger format for the first time at IMTS. HP Metal Jet will be broadly available in 2021. HP Metal Jet 3D printer at IMTS 2018. Photo by Michael Petch. A metal 3D print from the HP Metal Jet. Photo via Michael Petch. 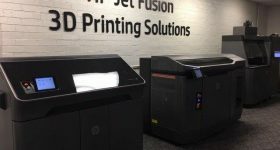 HP also has components from the color 3D printer Jet Fusion 300 / 500 series and one of the printers available for inspection. 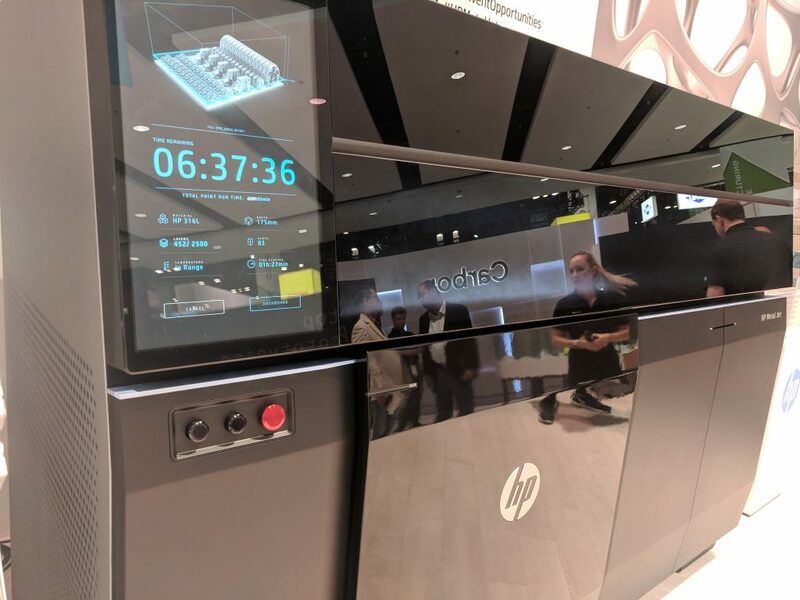 At the center of the HP booth, substantially larger than the 2016 version, is a display of the 140 components printed using Multi Jet Fusion systems that are used to manufacture HP 3D printers. 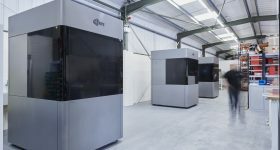 GE Additive has brought the Arcam Q10 plus and Concept Laser M2 UP1 – probably more familiar to the industry as the M2 Gen 3 Mk 4. At the center of the GE Additive booth are the AddWorks services that are part of turnkey approach GE hopes will accelerate adoption of AM. The upgraded Concept Laser M2 has several new hardware and software features intended to improve repeatability. This includes a redesigned process station and gas flow system intended to promote thermal stability. GE Additive’s CMO, Neil Siddons, tells me the focus here is “reliability, reliability, reliability.” Approximately 15% of these “production ready” systems go to GE companies with the majority shipping to external customers. Also at the GE Additive booth is the latest metal component to be made using the world’s largest powder bed system. 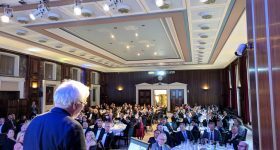 Officially announced in June 2017, 3D Printing Industry saw the ATLAS project’s first 3D print at Farnborough Airshow in July 2018. The 3D printed gear for an off-road vehicle on display at IMTS has significantly more mass. Approximately 650 mm in diameter it is made from HS188 alloy and still attached to the 100kg build plate. We’ll be returning in later articles to look at the other more well known 3D printing enterprises at IMTS. As the show is also an opportunity to meet newer entrants here are several that I spoke with on day one. Formalloy is at booth 432406 in the West Building. Based in California, Formalloy is the developer of the L-series (for labs) and X-series laser metal deposition additive manufacturing systems. Operating with a Formax metal deposition head both IR and blue lasers can be used. This means that Formalloy is able to offer one of the widest range of material options. 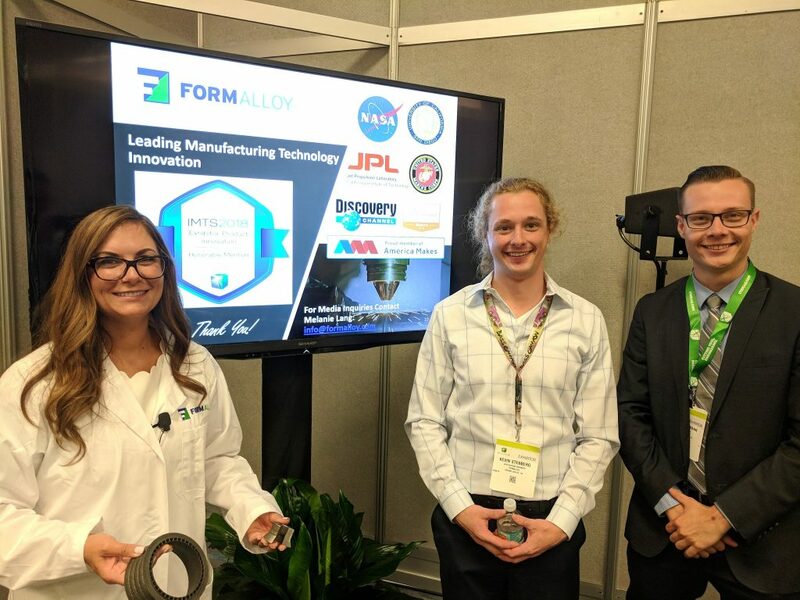 The Formalloy team and a component produced for NASA. Photo by Michael Petch. 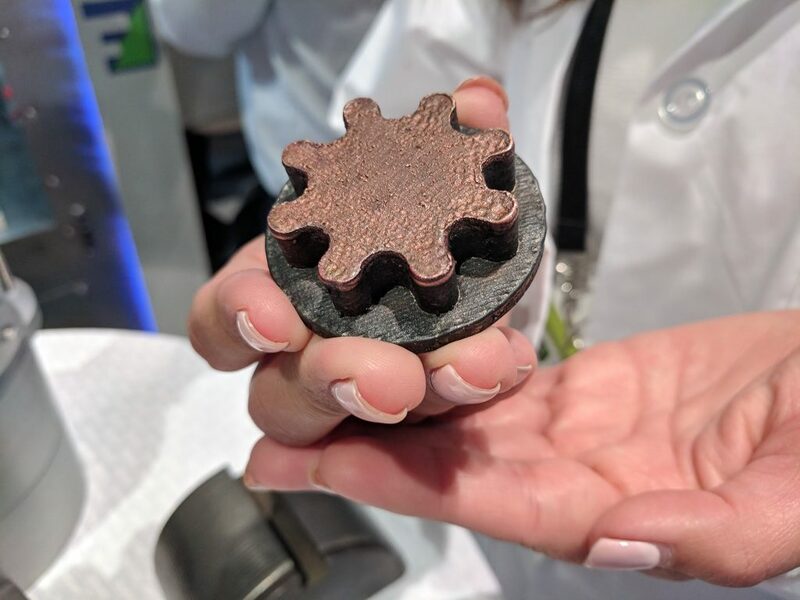 Formalloy 3D printing with copper at IMTS 2018. Photo by Michael Petch. 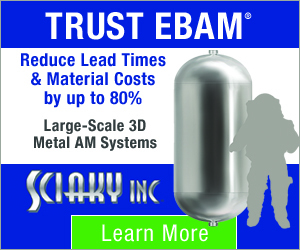 Digital Alloys can be found at booth 432001. 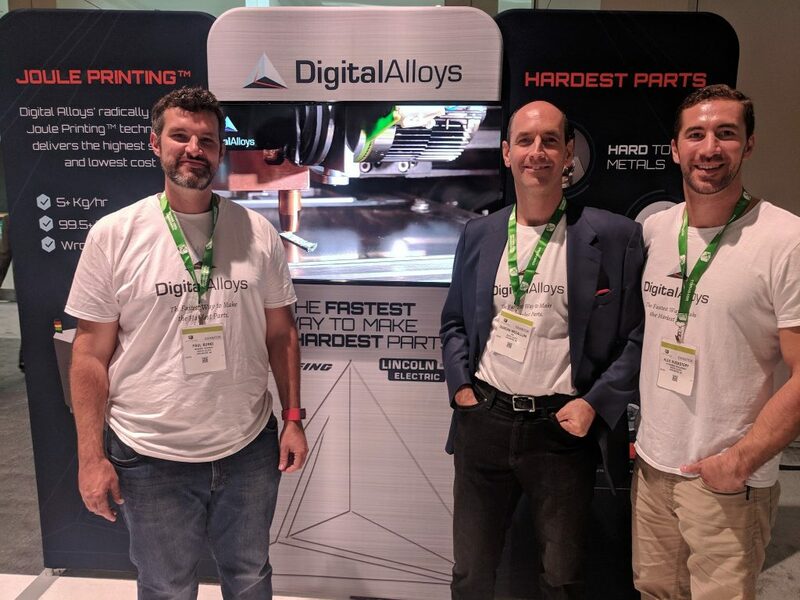 Having recently closed a $12.9 million funding round, Digital Alloys is developing a unique method of metal 3D printing they call the Digital Alloys Joule Printing system. This is a low-cost and incredibly fast method. The metal components on display included a 3D printed metal spring that despite my best efforts I was unable to destroy! The Digital Alloys team. Photo by Michael Petch. Digital Alloys metal 3D prints, with and without machining. Photo by Michael Petch. DM3D may be another company many are not familiar with. 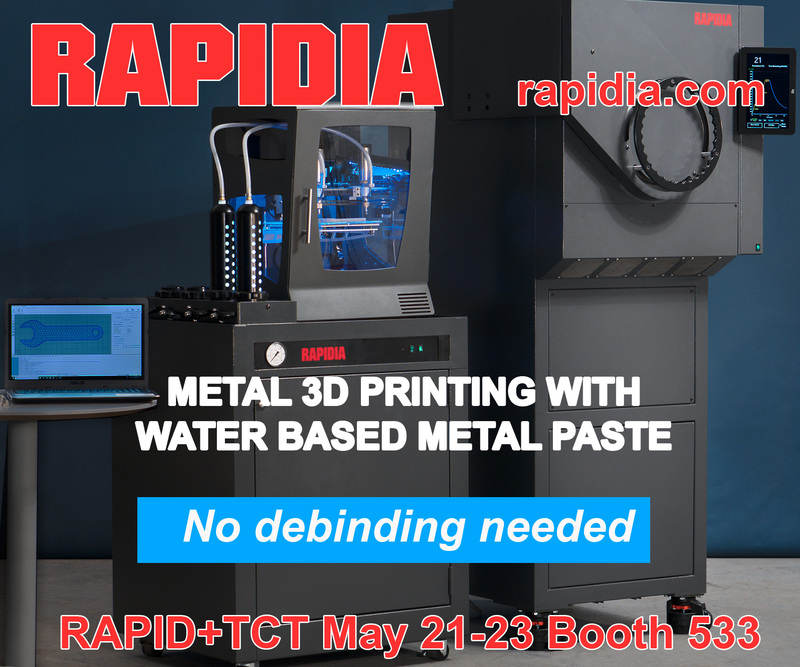 Based at booth 432305 this week, but more often in Auburn Hills, Michigan, DM3D are the developers of blown powder metal deposition. You can see a range of components including parts made using bronze and copper at their booth. Steel and bronze 3D printing from DM3D. Photo by Michael Petch. 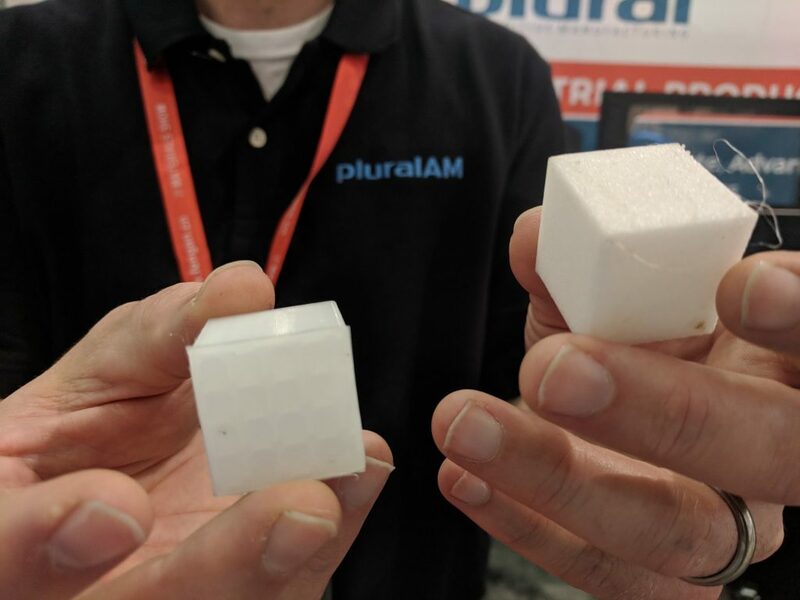 Moving to polymers, Plural Additive Manufacturing is at booth 431603. This US company has 3NTR FDM 3D printers on display. Additionally a materials handling solution is available and Plural will be able to demonstrate the dramatic difference correct materials handling makes. Visit them to see for yourself. Plural AM show the difference correct materials handling makes. Photo by Michael Petch. 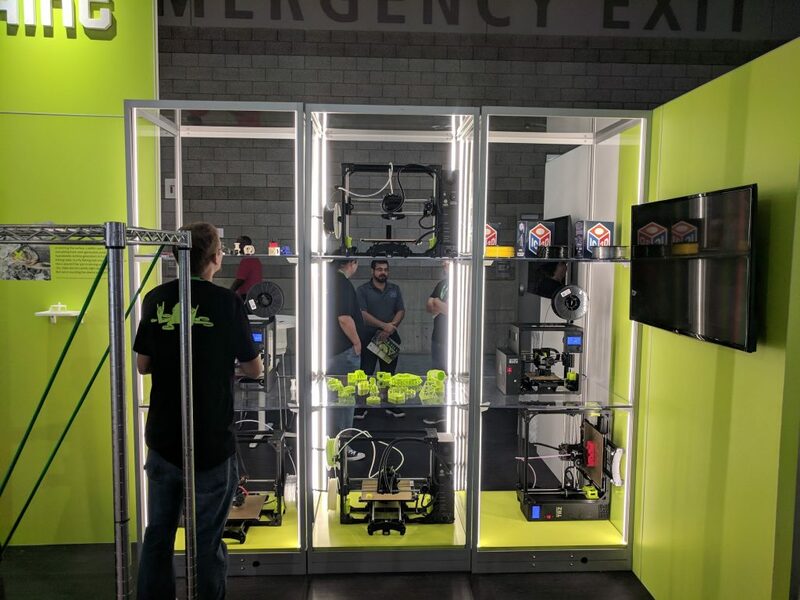 And finally (for today), Aleph Objects is demonstrating the Lulzbot range of 3D printers at booth 432419. 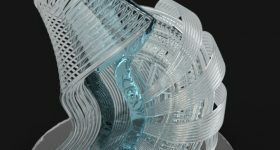 If you visit this maker of open source FDM systems don’t forget to ask them about their forthcoming SLA 3D printer – a “product” that I am told has already generated much interest. Today at IMTS marks the start of the several dedicated conferences. 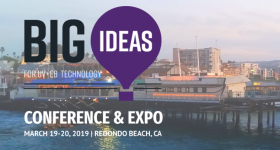 3D Printing Industry will be attending these and bringing more news and insights from Chicago all week.